Fig. 1. (A) Metaphase I spindles in ln(1)wm4/ln(1)dl-49/Y showing a chiasma in the X chromosome bivalent and the univalent Y chromosome orienting toward the lower pole. (B) Metaphase I spindles in ln(1)wm4/ln(1)dl-49/Y showing apparent nondisjunction of univalent X chromosomes caused by the Y chromosome. Bar: 10 |im. metaphase configuration is formed, but chromosomes move to an anaphase I-like configuration during prometaphase at stage 13E. 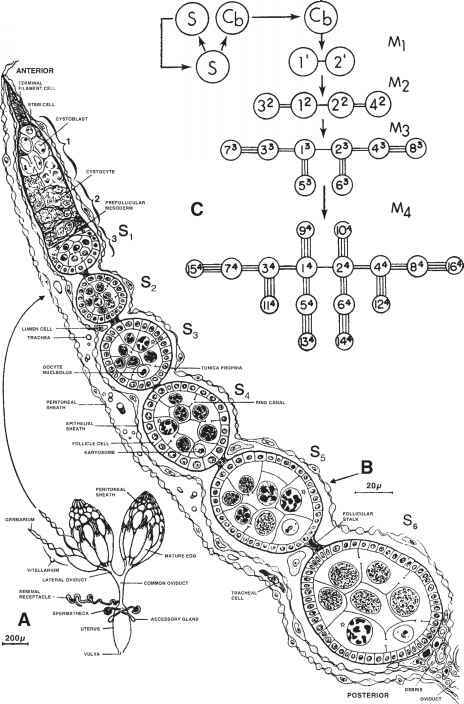 This configuration is found in the eggs at stage 14, being unable to proceed into meiosis II (7), apparently because the cell cycle machinery is signaling metaphase arrest. Some of the recombination defective mutants bypass metaphase I arrest and proceed to metaphase II (17,18). Metaphase I arrest is released and the meiotic cycle reactivated when the egg is transferred to the uterus. The egg is at anaphase I when sperm enters it, indicating that cell cycle activation is brought about by some unknown component present in the uterus. The meiosis I-late anaphase I spindle (see Fig. 2A) is transformed to meiosis II spindles (see Fig. 2B) by organizing the central spindle pole body at the equatorial site (19-22). Within the spindles, the dyads attain bipolar orientations. As a result of meiotic events, four haploid nuclei are formed, and if the egg is inseminated, fertilization follows. The events of fertilization in wild type or distorted by mutants can be analyzed in detail with the Schiff-Giemsa method described in this chapter (see, e.g., refs. 10,23).